We take the mystery out of window and door shopping. After you receive your online quote, you know the approximate cost of your project… no suprises! Why You Get The Best Deal? Consumers contact contractors to visit their homes to "get an estimate". 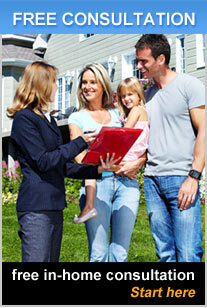 Typically a representative will visit with you to measure your windows and doors and leave you an estimate. Statistically, only one in ten of these estimates ever results in a sale. Because you are submitting your requirements including measurements to us, you are now saving us the costs of the initial visit to your home, where we would normally measure your windows and doors and present you with an estimate. When you indicate that you are ready to proceed with an order, our customer care representative will visit you to present and demonstrate our products, recheck your measurements and discuss the scope of your project. At this time all the details of the project will be finalized prior to proceeding with an order. It is important for us to visit you at your home as often your measurements may be incorrect, even if you have used our competitors’ measurements. After our representative has re-measured your windows and doors, you will be presented with our final offer which may well be lower than the online quote. All our cost savings are passed onto you, resulting in a great deal and saving you money! Star certified products at value pricing! At your convenience, measure the window and door openings of your home. Fill In Your Information In The "Quote Wizard"
After your quotation request is received, we will send you an quote within 48 hours of submitting your quote request. Still not sure how it works... need help? Call 1-888-742-9001 and we will help you.